It's that time of the year where I start making an annual wish list (nearing my birthday month, and Christmas month). So in random order, some of the things I have been looking at online. Philips Series 1000 Air Purifier - White $249. This was an affordable model I found on Harvey Norman's website. The premium model I have found would be the Dyson Pure Hot Cool Link which does cost a pretty penny. Umm, why air purifier? After living in a cigarette smoke logged house with youngsters who don't seem to care about the quality of air that they breathe in, and taking three days to clean it, my sanity is precious-- an air purifier is something I would like. Also to make the house smell better since I have two cats that make an air bomb mess in the house from time to time. 2. Vacuum cleaner - preferably bagged if possible. Something easy to use since the cats are constantly still making a mess around the house . Wet and dry is also a good feature. I was looking at the Karcher WD3 Premium Wet and Dry which is only available online on Harvey Norman for $129. I'm not sure if it is good, but it is cheap considering all the features it has. 10th October: I ended up getting one from Black and Decker Multipower Pet Vacuum using an EBay discount code. Will do a video YouTube review on it soon. 3. Slow Cooker: I recently was watching Eating Better for Less on YouTube. In one of the episodes, one of the mothers used a slow cooker to make a stew for her family. The thing that I do not like about using the traditional model of slow cookers are most of them do not have a timer setting, or a proper temperature setting you can set to cook your stew. I still feel that it is safer to have a timer setting on the slow cooker as with the last slow cooker I used, the stew went into cooking overdrive..... (not nice). 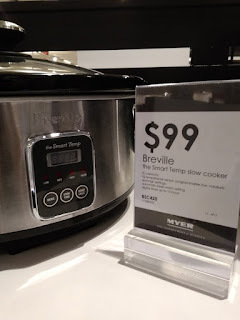 I was at Myers today, and decided to have a look at the models of the slow cookers they have available there. There were two models under $100, and they both look good. However this model has a timer, as well as temperature settings and currently retailing at The Good Guys till 10/10/18 for $71.40. 29/9/18: I ended up getting my own one from Harvey Norman! I bought the Sunbeam Electronic Slow Cooker from Harvey Norman for just $53.00 (it was $59, but had a further 10% discount this weekend). 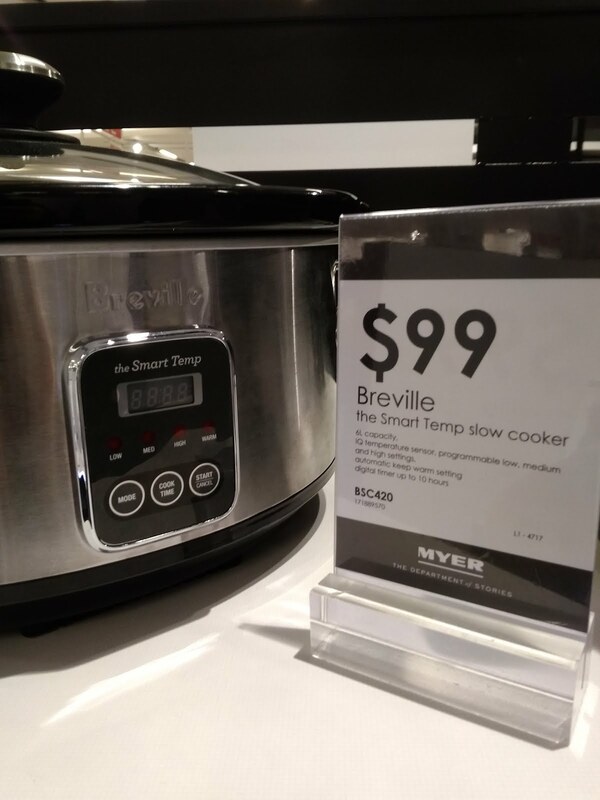 It was similar in terms of features to the Breville Smart IQ Temp ($71.40 on Amazon), but much cheaper! This year, there is no wish list for cosmetics, as I still have plenty from my cosmetics haul from this year's review sessions, and others that I have not started using yet! Skincare: After going through different skincare brands, I have to say that I like the AESOP range of skincare the best from the Parsley Seed range for normal to dehydrated skin. It is easy to source in Australia, and it is just good. I normally just use the face moisturiser, anti-oxidant serum. From time to time, I use the Estee Lauder's Advanced Night Repair Serum. The best beauty treatment for your skin is still: cleanse your face every night before going to bed, apply your face serum of choice, and night moisturiser; eye cream if you have any; and have a good night's sleep and drink lots of water.